Nadine Civitello has been performing since before she can remember. She has worked in dinner theaters, stage shows and in the improv arena. 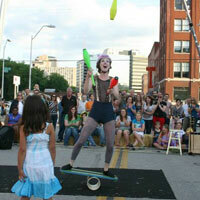 Nadine has been performing with local and state circuses as a juggler and acrobat. She is currently the emcee for MoonDrop Circus. She has been seen at the Kansas City Juggling Festival, KC Yoga Barn, Kansas City Renaissance Festival, and girl scout meetings. She excels at teaching coordination and movement. She is also a life-long learner of nutrition and fitness, and strives to continue to improve her knowledge. Nadine has been working in Emergency Medicine for 9 years and is a paramedic with the KC Fire department. Dennis Porter is the main happy face of Happy Faces Entertainment, which he created in 2001. He has been honing his professional clowning techniques since 1999 and has a degree in theatre/business from William Jewell College. Dennis has worked on and off-stage for most of his life with community, educational, amusement park, and professional theaters around the country. Dennis performs professionally as a clown, actor, magician, storyteller, balloon artist, improv comedian, instructor, and emcee. He takes his years of education and life skills to make each program fun. In a small group or large crowd, everyone seems to relate to his high-energy demonstration of enjoying life to its best.